When it comes to tile and grout cleaning it is relatively easy to clean tiles that have a smooth surface. But most people for safety measures install non slippery tiles. Non-slippery tiles have a granular, or matte finish. This creates friction between the foot and the tiles when there is water on the floor. 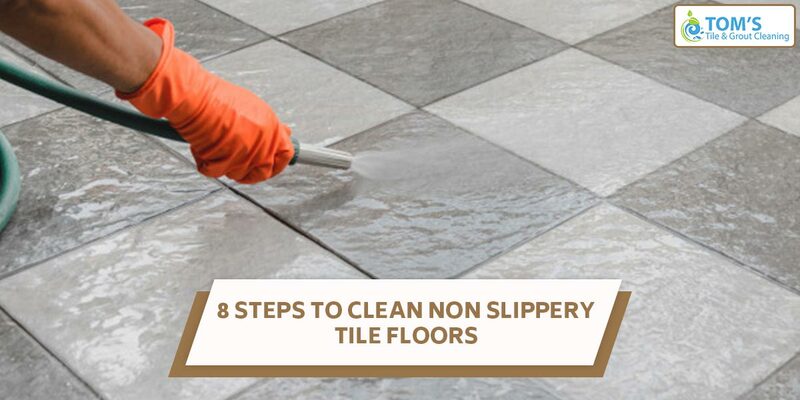 Generally speaking, non-slippery tiles should always be preferred over glossy tiles but one con of such tiles is that they are very difficult to clean. The dirt sets in between the indentations on the tiles. Wet the entire surface to be cleaned with water. You do not want to flood anything, so make sure to not spill more water than needed. Sweep with a long bristled brush to wipe off any loose debris. Sprinkle powdered form of cleaning agent with oxalic acid onto the wet floor. The wet floor will the cleaning agent to seep into the surface of the tiles. Do not start scrubbing as soon as you sprinkle the cleaning agent on the tiles. Let it stay for 5-10 minutes. While this is happening make sure the floor does not dry. After 5-10 minutes start brushing the floor with a long brush, for areas that have rust, or other stubborn stains you can use a short brush. If you find more stubborn stains that do not come off easy apply more of the cleaning agent. Use a wiper to remove water to the gutter. Now dry the floor with a towel. Although mostly all commercially available cleaning agents have been tested and been declared safe for use on floor tiles and grout it is always advisable to them first on an inconspicuous spot on the tiles. To make cleanup easier, ensure the floor is wet before you add Bar Keepers Friend. The water will help keep it from seating in the texture of the tile. To know more on tile and grout cleaning call Toms Tile And Grout Cleaning Melbourne on 1300 068 194.